Manama, Oct. 1 (BNA): Under the patronage of HRH Princess Sabeeka bint Ibrahim Al Khalifa, Wife of HM the King and President of the Supreme Council for Women, Art Bahrain across Borders (ArtBAB) has announced its first art exhibition in Singapore. The exhibition, "Legacy", showcases 18 Bahraini established and emerging artists whose works across varying media, explores their cerebral resilience and maturity and the way Bahraini contemporary art catches the spirit of the Kingdom’s 5,000 year-old cultural heritage. The exhibition in Singapore will open a private VIP Preview on October 22 and will run until October 27 at the Museum of Contemporary Arts. A team of journalists and influencers from Singapore are currently visiting Bahrain to get to know the finer points of Bahraini contemporary art and meet the artists. The 18 Bahraini participating artists are Ayman Jaffar, Ahmed Al Asad, Ahmed Anan, Amina Al Abbasi, Balqees Ahmed Fakhro, Faika Al Hassan, Hesham Sharif, Hanan Al Khalifa, Jamal A. Rahim, Linda matter, Lobna Al Amin, Lulwa Al Khalifa, Mariam Ali Fakhro, Nabeela Al Khayer, Noof Al Refaie, Omar Al Rashid, Seema Baqi, and Taiba Faraj. 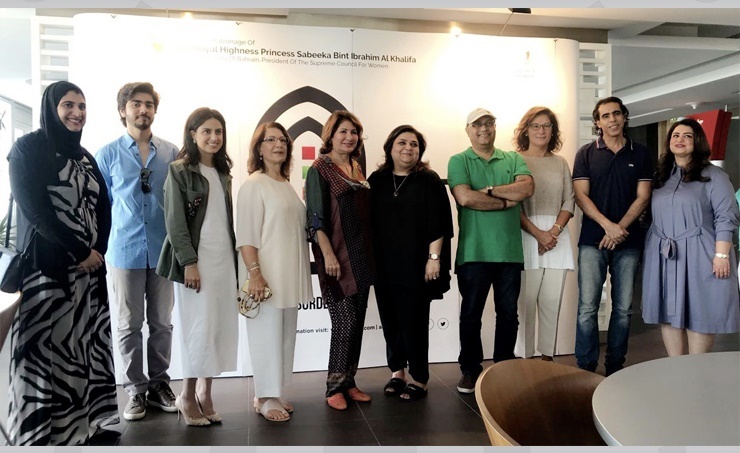 “Our Singapore show is the third one this year which represents the very busy period that our Artists Across Borders programme has been witnessing,” Shaikha Maram bint Isa Al Khalifa, Director of HRH Princess Sabeeka’s office, said. Keneka Subberwal, ArtBAB Fair& Programme Director, said it was an exciting show because Bahraini artists will be sharing their work with contemporaries at one of the richest and most artistic Asian cities. "We are so proud of the way in which our Bahraini artist have held their own all over the world, the praise that they have garnered and more importantly, Bahraini art has won praise from collectors and critics in these countries," she said. "They have added value to their work from the exposure that our artists Across Borders programme has given them." The Artists Across Borders programme recently held a show in Paris where the Bahraini art exhibition was held at the Grand Palais and at the Gallerie Robouan Moussion. The Singapore show is part of a widening circle of overseas engagements for Bahraini artist through the Artists Across Borders programme.